Finance Minister Arun Jaitley has earmarked Rs. 1.48 lakh crores as railways’ total capital and development expenditure for 2018-19 (April-March). This is nearly 14 percent higher than the Rs 1.3 lakh crore Jaitley had set aside in the last financial year. Jaitley in the last budget had announced the establishment of a Rashtriya Rail Sanraksha Kosh for passenger safety. The fund will have a corpus of Rs. 1 lakh crore over five years. According to reports, the railways aims to end FY19 with an operating ratio of 93 percent, a 200 basis point improvement from 2017-18’s 95 percent. Operating ratio is a measure of money spent to earn every rupee, and hence, the lower, the better. The railways no more announces its operating ratio, a practice it stopped last year when the Railway Budget was merged with the General Budget. India is expected to unveil only modest stimulus at this week's budget, a Reuters poll of analysts showed, despite it being the last before the next election, with government spending likely limited by longer-term efforts to trim the fiscal deficit. Fiscal consolidation was first proposed by Prime Minister Narendra Modi's Bharatiya Janata Party (BJP) government in its maiden budget in fiscal 2014/15, aiming to break a long line of Indian governments that preferred to borrow and spend. "As the current government will present its last full-year budget before the 2019 general elections, many in the market expect a heavier dose of populism. However, the government has limited financial resources to propose any targeted scheme for the poor," wrote Gautam Duggad, head of research at Motilal Oswal Securities, in a research note. "We also do not expect much relief on the tax front, except some reduction in the corporate tax rate for medium-sized companies." The government's own economic survey presented to parliament on Monday suggested that pushing further out the fiscal deficit target would give the economy some momentum. For the current fiscal year, the target is 3.2 percent and the government is unlikely to meet that as it has already overshot its full-year goal.With less than one quarter of the fiscal year left, the government is unlikely to meet its deficit target. Three-quarters of the 40 economists polled, based in India, Singapore and Europe, said that fiscal consolidation is likely to be Finance Minister Arun Jaitley's dominant theme when he unveils his budget on Thursday. Some also said the focus on the potential budget provisions could address rising rural dissatisfaction shown by the increase in farmer protests and suicides across India. "We expect India's upcoming Union Budget to focus extensively on the agriculture sector, especially given that the government has only one year left in its current term and will want to boost its popularity before the next election," noted Kunal Kundu, India economist at Societe Generale. India's economy is forecast to grow by 6.6 percent in the current fiscal year, which would be its weakest since before a new calculation was introduced in fiscal 2014-15, a Reuters poll of economists found earlier in January. The Economic Survey for 2017-18 presented a sober picture for delayed infrastructure projects as out of 482 road-related projects, only 43 face cost overruns and 74 face time overrun. The Economic Survey which was tabled on Monday in the Parliament gives a review of the year gone by before the Union Budget for the next financial year is presented. Union Budget for 2018-19 will be presented on February 1. It was pointed out that out of 1,263 infra related projects during 2017-18, projects worth Rs 3,17,373.9 crore belonged to roads and highways which faced delay in execution due to bottlenecks in obtaining land clearances, public agitation and arbitration-related issues. “Some of the projects under different phases of National Highway Development Program are delayed mainly due to problems in land acquisition, utility shifting, poor performance of contractors, environment/ forest/wildlife clearances, Road Over Bridge (ROB) & Road Under Bridge (RUB) issue with Railways, public agitations for additional facilities, and arbitration/ contractual disputes with contractors etc,” said the survey. One of the glaring observation made by the Survey pointed out that Roads Sector witnessed increase in Non-Performing Asset (NPA) to 20.3 percent as of September 2017. In his keynote speech at World Economic Forum in Davos Prime Minister Narendra Modi spoke about renewable energy, terrorism, data, reforms, among other things. This is Modi's second visit to Switzerland in nearly two years after his visit in June 2016. India will be the world's fastest-growing major economy in 2018, according the IMF's latest World Economic Outlook update. India's GDP has been growing at around 7% per year since Prime Minister Narendra Modi took office back in 2014, and next year India’s economy will be one-third bigger than when he came to power. However, major economic and social challenges - such as income inequality, gender disparity and extreme levels of pollution - persist. Today, we face new and difficult challenges in terms of economic outlook and security. Technology driven transformation is taking place everywhere and data presents us with great opportunities to solve such issues. But data also presents its own challenges. It is believed whoever controls data is the most powerful and can shape the world. Modi also spoke about terrorism. “As dangerous as terrorism is, even more dangerous is the artificial divide created between good and bad terrorists,” he said. Modi also said that some two decades later, we live in a society that is a network of other complex networks. Today, we are living in the world of big data, AI and robots. Technology has impacted every aspect of our lives. This is creating the greatest opportunities, but also huge challenges, said the Indian PM. Rapidly changing technology could lead us to prosperity, but it is also creating fault lines, he added. Modi at WEF said that Indians are proud of their democracy and diversity. “For a society with diverse religions, cultures, languages, attires and cuisines, democracy is not just a political system but a way of living,” he said. In India democracy, demography and dynamism are giving shape to development and destiny, he added. Change in India's ranking is an indicator that the people in India have warmly welcomed the change in policies as the road to a better future for them, Modi said. India has cut red tape and removed artificial borders within the nation by introducing one nation, one tax in the form of GST, he added. Modi also talked about how working, travelling and manufacturing in India is way easier now and added that all sectors of India are open for FDI. It is necessary for the big powers to cooperate between themselves. We will have to set aside our differences, Modi added. He added that looking at the many fractures and many cracks in the world, it is necessary that everyone should focus on multiple directions for a shared future. Harry Potter was an unheard name, tweeting was done only by birds and Amazon referred to dense forests in 1997, Prime Minister Narendra Modi said today to stress upon the changes the world has seen in the past 20 years. “The world is changing fast today and there are new and serious challenges related to peace and security and various other matters,” Modi said. He also noted that the last time when an Indian prime minister came here in 1997, India's GDP was a little more than USD 400 billion, but now it has increased more than six times. Former RBI Governor Raghuram Rajan today said the Western world must realise they cannot go a long way without the help of the emerging economies and warned that no one would be able to resolve any problem of a 'fractured world' if things are not set right soon. Without naming any country, he said the West must realise that their population is ageing and the demand for their products would mostly come from the emerging world. Speaking here at a session of the World Economic Forum (WEF) Annual Meeting, Rajan said there is a risk that by the time the West goes to the emerging world for their support, they may have to answer quite a few questions about why they did not share the benefits earlier. He warned that the approach of the Western world must change soon for the good, or else there may be a chance that we are not able to solve any of the problems of the 'fractured world'. About issues facing the Western world, he listed technology, ageing population and climate change. Rajan was speaking at a session on the power of economic narratives and how policymakers can address the challenges of the 21st century. He said some governments such as Singapore have done something to address the problems arising out of income inequality and the divisions in the society by setting up housing projects where middle class and lower middle class families can live together. Rajan said he's not sure about the US but some countries are doing things in this area and certainly the governments can play a role here. The Chicago University professor is known for his frank views on various economic and monetary policy matters and is credited with having predicted the global financial crisis of 2007. "When the economist hears the word narratives and stories he thinks it's below me. They believe they are beyond the tradition of narratives," he said. Post World War II, we realised we have to come together once again and we need to break barriers of trade and everything else, he said. Asked whether he is optimistic or pessimistic on the issue of narratives, Rajan said politicians just pick the economic theory that fits in their scheme of things but he hopes things do not go out of hand and there is a solution before that. He also said that for a long time technocrats were given a free hand. "That pushed growth for a long time but then frictions began including between right and the left," Rajan said, adding that since the global financial crisis, the world has begun to question the technocrats. He cautioned that the economists have a much harder task today and there are a lot of answers that they need to come up with. "But the even harder task is to convince people that believe us and we will set things right," he said. Rajan said we should realise that big ideas are always thought at least 15-20 years in advance. "So if we talk about universal basic income, we can't brush it aside and today we are seeing people are talking about it," he said while giving examples. In another example, he said driverless cars are on the horizon today but we should also assess their impact on jobs. "We need to think what we are going to do when these people go jobless once driverless cars become widespread reality on our roads," he said. Private general insurance company Bajaj Allianz General Insurance's chatbot ‘BOING’ has made its debut on Amazon’s Alexa. The company is the first in the Indian insurance industry to use Amazon’s cloud based voice service Alexa, which is available on Amazon’s Echo. For instance, they can locate branch, locate hospital or workshop without any authentication required. In the next phase, services like registering a motor & extended warranty claim, renewing motor policy, getting soft copy of the policy, checking policy status & claim status (health and motor), etc. will be enabled. BOING will be added as a skill within Alexa’s skill set enabling customers to interact with BOING through voice enabled commands. For instance, customers can ask their Amazon Echo Device, 'Alexa, ask BOING what is non claim bonus?. Alexa will immediately reply to the command. Initially, BOING on Alexa will answer insurance related queries which don’t require any authentication and can be accessed by anyone, soon policy servicing related features like registering a claim, status of policy/claim, getting the soft copy of the policy, which require policyholder authentication will be rolled out. Tapan Singhel, MD & CEO, Bajaj Allianz General Insurance said, “The next wave of digitalization will be driven by ‘voice’ which will make the customer interaction even simpler and will take their experience to the next level. Through this move, our aim is to improve customer experience by being present where they are." The general queries on insurance can be accessed by anyone even if that person is not a policyholder. Queries related to policy of the customer will have an authentication process before which Alexa will respond to the query. Finance and Corporate Affairs Minister Arun Jaitley today said online availability of data has opened corporate activities to public gaze and raised the possibility of detecting any impropriety. He said the ease at which the data is available now and is open for dissection has put pressure on everyone to ensure that there is compliance and transparency. "It's now all open to public gaze. And being open to public gaze has its own advantages. It has the advantage that there is a pressure on everyone to make sure that compliances do take place, everyone is on his feet and realised that if there is any impropriety the possibility of it being detected is going to be very high," said Jaitley, who also holds the charge of the Corporate Affairs Ministry (MCA). The minister was speaking at the launch of National CSR Data Portal and Corporate Data Portal of the MCA. He said because of online availability of data, it has become easier to dissect any impropriety, including that of funds being channeled through shell companies. "Therefore this transparency is good for the system, good for corporate India, it's good that your details to the extent that are to be made public, are being made public," Jaitley said. With regard to corporates undertaking CSR activities, Jaitley said the 2013 amendment in the Companies Act has almost "formalised corporate philanthropy" in India. Under the Companies Act, 2013, certain class of profitable entities are required to shell out at least two per cent of their three-year annual average net profit towards Corporate Social Responsibility (CSR) activities. Jaitley said philanthropy in India, unlike in the West, was more family and community centric, religious groups and caste groups, social groups did it. "But corporate India didn't have a structured manner of doing it. Some did it on their own initiatives. Now even though the provisions have been incorporated persuade corporate India to move in that direction, so far I think there has been a fairly credible and positive response to it," he said. Jaitley said a public gaze into the CSR activists through the MCA portal would further institutionalise and consolidate it. As per the Companies Act, in case a company fails to spend the specified amount, then its board has to provide the specific reasons for the same in the board report. A total of 5,870 companies shelled out Rs 9,553.72 crore towards CSR activities in 2014-15. In 2015-16, as many as 7,983 companies incurred CSR expenditure of Rs 13,625.24 crore, as per official data. The internet, when it rose to global consciousness and became an overwhelming harbinger of disruption across society, economies and industry, created enormous wealth and value in disrupting existing practices and building cheaper, more accurate and efficient systems. Its advent promised much in terms of decentralizing and democratizing access to information, value and services. It promised to remove barriers and middlemen, vastly reduce operational and logistical costs in so many ways. And it has, to an extent, that the average human being can’t not be exposed to the internet multiple times every waking (and sleeping) day. The latest disruption, blockchain, and with it, the rise of cryptocurrencies show the way to the next stage, by creating decentralized computer networks capable of holding value, contracts, agreements, transactions in an encrypted manner. By truly decentralizing the network that creates this value, it removes a dependency on any one authority or institution to reduce, remove or change the value of any such holding. And the first initiative off the table with the rise of blockchain computing would be Bitcoin, a digital currency or cryptocurrency. The creator of bitcoin is Satoshi Nakamoto. The name is a pseudonym -- no one knows who she or he actually is. Besides being the creator, Nakamoto holds enough bitcoin to flood the market, crashing its value and rendering it worthless. In addition, the founder can also influence any debate on future directions of Bitcoin, thereby holding huge potential implication for the future of crytocurrencies as a whole. Bitcoin is but just one cryptocurrency. 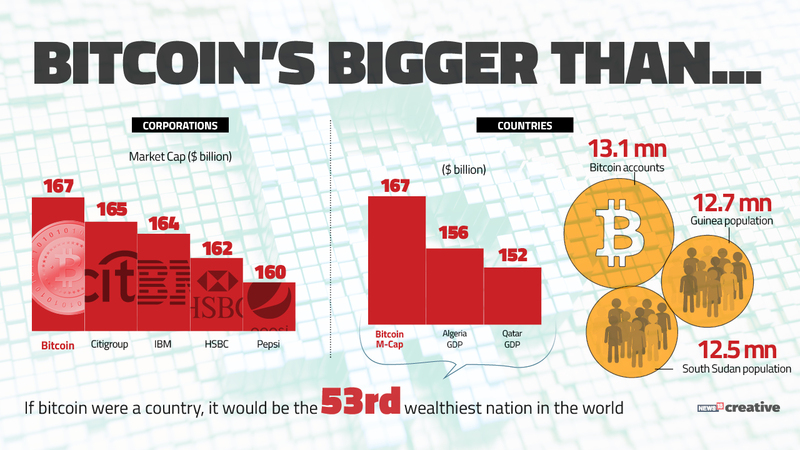 It is the leading one, however, with a total market value of USD 231 billion as of publishing time, accounting for 36% of the total value of all cryptocurrencies. 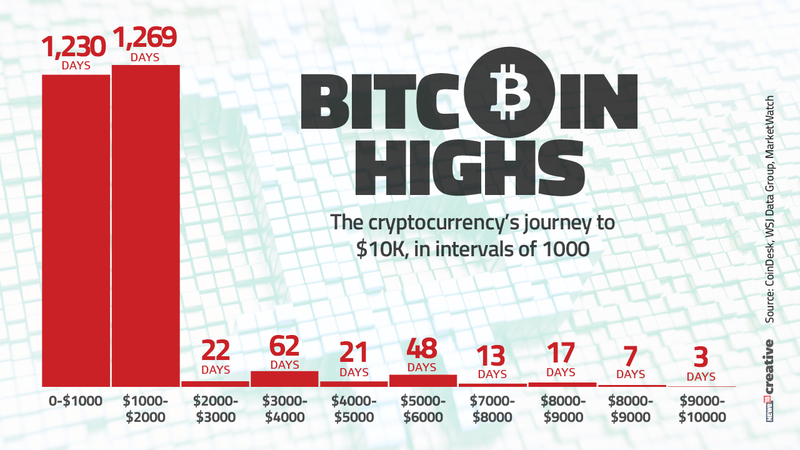 The entire crypto currency market hit its peak value at about USD 700 billion in January 2018. Ethereum (13% market share) and Bitcoin cash (8%) are just two other major cryptocurrencies that are being traded today. The mystery surrounding the identity of Bitcoin creator Satoshi Nakamoto continues to cause intrigue. But nobody, not even his closest collaborators, has ever met Mr Nakamato in person. Although s/he not only wrote the white paper, but also the first version of the software powering the system, s/he eventually stopped participating. “I have moved on to other things,” s/he wrote in April 2011. # In March 2014, a US magazine Newsweek, identified Dorian Satoshi Nakamoto, a man living in California, as the real Satoshi, but this turned out to be an embarrassing mistake. He lived near another possible suspect Hal Finney. # Computer scientist Hal Finney, who was the recipient of the first Bitcoin transaction, is also sometime speculated to be the creator of Bitcoin. Finney was an early employee of cryptography company PGP and also knows “decentralised currency enthusiast” and scientist Nick Szabo who penned a paper on "bit gold" way back in 1998 and was said to be a fan of pseudonyms. Szabo seems to have asserted in 2011 that only he, Finney or Wei Dai - creator of Bitcoin precursor B-Money - could have been responsible for Bitcoin. # Craig Wright, an Australian businessman and computer scientist, had in May 2016 posted online what he claimed to be proof that he is Satoshi Nakamoto. That was supported by Gavin Andresen, Mr Nakamoto’s successor as the lead developer of the bitcoin software; however, the claim was widely seem to have been debunked as fake. # In November 2017, a blog post by former SpaceX employee claimed that Elon Musk was Satoshi Nakamoto, given his fondness for C++, known skill with cryptography, linguistic habits that seem close to Nakamoto's and general all-round billionaire polymath-who-likes-to-solve-big-problems status; Musk himself has denied it. Proof of work is perhaps the strongest idea behind Nakamoto’s Bitcoin white paper because it allows trustless and distributed consensus. The Proof of work concept existed even before bitcoin, but Satoshi Nakamoto applied this technique to digital currency revolutionizing the way traditional transactions are set. A trustless and distributed consensus system means that if you want to send and/or receive money from someone you don’t need to trust in third-party services. Proof of work is a requirement to define an expensive computer calculation, also called mining, that needs to be performed in order to create a new group of trustless transactions (the so-called block) on a distributed ledger called blockchain. All the network’s miners compete to be the first to find a solution for the mathematical problem that concerns the candidate block, a problem that cannot be solved in other ways than through brute force, essentially requiring a huge number of attempts. When a miner finally finds the right solution, he/she announces it to the whole network at the same time, receiving a cryptocurrency prize (the reward) provided by the protocol. In this system the probability of mining a block is dependent on how much work is done by the miner. Originally published by Cynthia Dwork and Moni Naor back in 1993 as an idea, the term “proof of work” was coined by Markus Jakobsson and Ari Juels in a document published in 1999. Bitcoin gives anonymity to transactions if used correctly. This has made it useful for many illicit transactions. But there are many mainstream businesses beginning to accept Bitcoin as well. # Overstock.com, a large online retailer in US, was the first big online retailer to start accepting Bitcoin in January of 2014. The company allows its customers to pay for laptops, television sets, furniture, etc. with Bitcoin. It also supports other major cryptocurrencies, including Ethereum, Litecoin, and the new Bitcoin Cash through Coinbase partnership. # Newegg, an online electronics retailer, accepts Bitcoin as a payment method. # Expedia, a travel site, started accepting Bitcoin for payments for hotel bookings in 2014 through tie up with Coinbase. # Subway franchises in Buenos Aires, Argentina in 2017 started accepting Bitcoin for payments at the restaurants. # Microsoft has started accepting originally published by Cynthia Dwork and Moni Naor back in 1993 originally published by Cynthia Dwork and Moni Naor back in 1993Bitcoin from users to purchase games, movies and apps in the Windows and Xbox stores, as well as the Microsoft online stores. # Bitcoin can also be used to pay for space travel as since 2013, Virgin Galactic, a commercial space flight venture by Sir Richard Branson, accepts purchases using Bitcoin. # The now closed Silk Road website, an online black market, was almost the eBay or Amazon of drugs. Bitcoin was the payment method for transaction. It famously ran as a Tor hidden service and used masked address to help keep users anonymous. But Silk Road was shut down in October 2013 after FBI investigations busted Ross Ulbricht as alleged founder. FBI may be rueing the day it sold its hoard of Silk Road Bitcoin for $48 million as those coins are now worth an astonishing $2+ billion. # There are other dark markets that do trade in illicit goods using Bitcoin. These include Silk Road 2.0, Agora, White Rabbit Anonymous Marketplace, Outlaw Market and The Pirate Market. Many have been and continue to be taken down by government agencies where possible. # Wannacry, a ransomware that affected 200,000+ computers globally in 2017, asked for the equivalent of $300 in Bitcoin to unlock their victim’s machines; the attackers were able to collect the equivalent of ~$55,000 (at Bitcoin rates of ~USD 1500). # Drug dealers have been suspected to be using cryptocurrency ATMs in London to stash the proceeds of their crimes, London's Metropolitan Police has said. There are around 50 Bitcoin ATMs in London which allow swapping of cash directly for cryptocurrencies without alerting law enforcement in the way a large cash deposit at a bank might. There are globally 1900+ Bitcoin ATMs, of which 30% or so also support other cryptocurrencies. A Bitcoin A.T.M. accepts a normal currency (e.g. 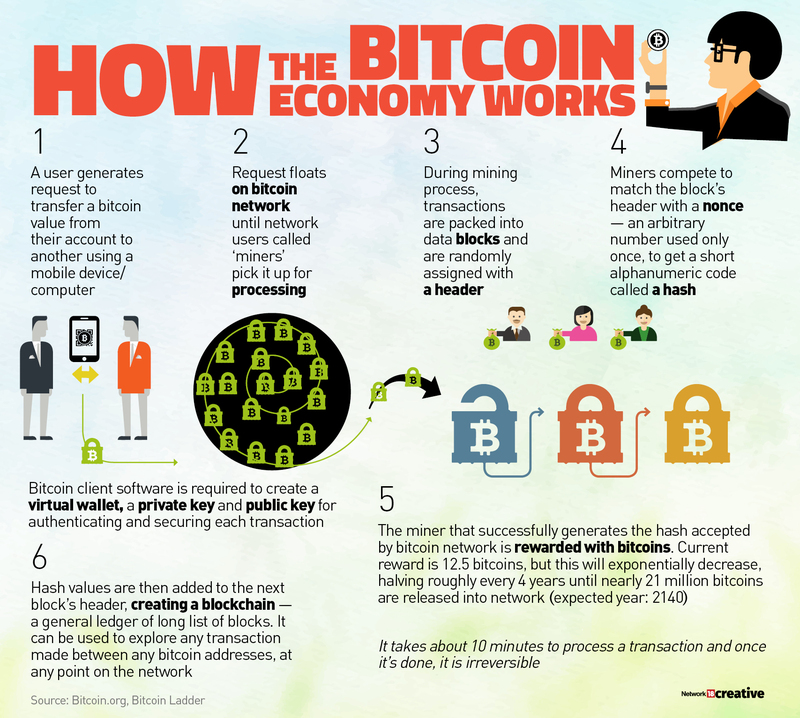 US dollars) and in return adds the bitcoin equivalent (less any transaction charges) to a customer’s digital wallet. So, a user will need to have a Bitcoin Wallet where this amount is transferred. Since verification standards are less stringent than online exchanges, the law enforcement agencies have raised the prospect of money laundering via such Bitcoin ATMs. Bitcoin ATM manufacturers include Genesis Coin, General Bytes, Lamassu, Coinsource and others. North America accounts for 75% of these ATMs (1000+ in US alone) with Europe having ~20% and Asia another 2%. Bitcoin wallets store the private keys that one needs to access a bitcoin address and spend the funds. They store the secure digital keys used to access the owner’s public bitcoin addresses and sign transactions. These wallets can be software based (desktop, mobile, web) or even be on specialized hardware. Desktop wallets include those that run on Windows, Linux or OSX and include the original Bitcoin Core as well as others like ArcBit, Electrum, Armory, et al. Mobile based wallets overlap with those for desktop (e.g. Bitcoin Core, ArcBit, Electrum). Some of these mobile wallets offer the advantage of enabling payment for transactions at vendors accepting Bitcoin. Coinbase, an integrated wallet/bitcoin exchange is one of the more popular operators of an online wallet worldwide. All these can be categorized as Hot Wallets. Because hot wallets generate the private keys on an internet connected device, these private keys can’t be considered 100% secure. Cyber-criminals could, potentially, target your computer’s “software wallet” and steal them by accessing the owner’s private key. Generating and storing private keys offline using a hardware wallet, also dubbed cold wallets, ensures that hackers have no way to reach the stored Bitcoin. Since these are not free, unlike software wallets, these may only make sense to store sizable amounts of Bitcoin. The all-important private keys are maintained in a secure offline environment on the hardware wallet, mostly protected even should the device be plugged into a malware-infected computer. Some of these have screens which can provide extra security by verifying and displaying important wallet details. Hackers would have to steal the hardware wallet itself, but even then, it can be protected with a PIN code. The major hardware wallets include KeepKey, Ledger Nano S, Trezor & Digital Bitbox. Another popular and cheap options for keeping Bitcoin safe is something called a paper wallet. There are several sites offering paper bitcoin wallet services. They will generate a bitcoin address for and create an image containing two QR codes: one is the public address that can be used to receive Bitcoin; the other is the private key, which can be used to spend Bitcoin stored at that address. On August 1st 2017, a dissident faction of the Bitcoin community created a new payment network called Bitcoin Cash, which branched off from the existing Bitcoin blockchain. One could almost call it analogous to a stock split: each holder of Bitcoin on this date also got a certain amount of Bitcoin Cash. 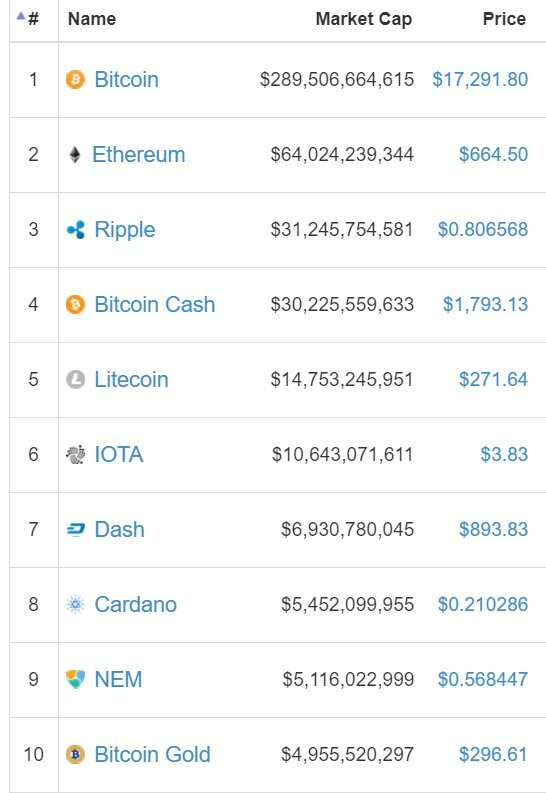 Bitcoin cash is now the 3rd most valuable cryptocurrency. All this created value almost out of thin air i.e. the USD value of Bitcoin plus Bitcoin Cash was higher than what it was of Bitcoin just before the fork. A fork is created when there are tweaks to the established formula governing the blockchain underlying a cryptocurrency. Bitcoin Cash increases the size of an individual block by eight times compared to Bitcoin blockchain, which allows for faster transactions. Bitcoin Gold uses an algorithm that discourages the use of specialized mining hardware in an effort to make the currency more egalitarian. Calling a fork after Bitcoin gives it instant name recognition and also creates a group of stakeholders i.e. existing Bitcoin holders who may seek legitimacy, liquidity and support for new currency as they automatically become owners of the new currency. They may in turn arm twist exchanges and if a bunch of exchanges announce support for a new currency—or at least the ability to withdraw balances—that amounts to a de facto endorsement of the currency. And if an exchange does the work to allow customers to withdraw a Bitcoin variant, they might go all the way to supporting it for deposits and trading, too. Although Bitcoin Cash and Bitcoin Gold have dominated the news around forks in 2017, Litecoin was one of the earliest Bitcoin forks to be successful. Ethereum has also undergone almost five forks since inception, including a fork nicknamed Byzantium in 2017 and another that created Ethereum Classic in 2016. It remains to be seen which forks create value going forward. # Venture capitalists, Barry Silbert and Tim Draper got 48,000 and 30,000 Bitcoin respectively in an auction held by the U.S. Marshals Service in 2014, which the government had seized from Silk Road, an online marketplace it said was used for illegal drugs. Bitcoin was around USD 350 at that point. 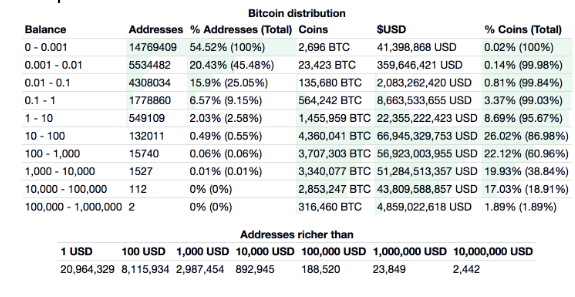 # There are 2,422 accounts publicly known to have USD 10 million worth of Bitcoin in each of them as per bitinfocharts.com. The energy being spent on mining Bitcoin and other cryptocurrencies has become a controversial issue. To address that, Bitcoin’s competitor, Ethereum is looking to move also migrating towards what is called Proof of Stake with its new “Casper” protocol. The plan effectively means ethereum will begin alternating between the two systems, so that some transaction blocks (one out of 100) are secured via proof-of-stake and the rest remain on proof-of-work. In proof-of-stake, participants similarly commit money to the system, but not with electricity and equipment. With Casper (Ethereum), virtual miners, known as Validators, commit money to the system with the understanding that they will lose their deposits if they don't follow the rules. In general, a proof of stake algorithm looks as follows. The blockchain keeps track of a set of validators, and anyone who holds the blockchain's base cryptocurrency (ether in Ethereum's case) can become a validator by sending a special type of transaction that locks up their ether into a deposit. The process of creating and agreeing to new blocks is then done through a consensus algorithm that all current validators can participate in. There are many kinds of consensus algorithms, and many ways to assign rewards to validators who participate in the consensus algorithm, so there are many "flavors" of proof of stake. One is the chain-based proof of stake, where an algorithm pseudo-randomly selects a Validator during each time slot (eg. every period of 10 seconds might be a time slot), and assigns that validator the right to create a single block, and this block must point to some previous block (normally the block at the end of the previously longest chain), and so over time most blocks converge into a single constantly growing chain. This allows building a trusted and distributed network with loyal Validators (high stake of coins). The Validators earns the part or whole of the transaction fee. In Proof of Stake, it is not “mining” but “forging” which is done by the Validator who will process and forge a block to the chain. In this case, the need for expensive mining hardware and the concurrent electricity consumption issues of Proof of Work are addressed. Ether, Bitcoin’s largest competitor, began from an altogether more transparent initiative compared to the mystery surrounding Nakamoto. The project Ethereum was initially bootstrapped funded by fans and founded under the Ethereum Project, a Swiss non-profit organization. Ethereum underwent a hard fork in mid-2016 owing to the DAO event. The DAO was a digital decentralized autonomous organization, and a form of investor-directed venture capital fund. It raised a record $150 million in investment via crowdfunding in May. However, in June, users exploited a vulnerability in the DAO code to siphon off a third of its funds to a subsidiary account. The debate over restoring all the funds to the original contract virtually led to a hard-fork, giving birth to Ethereum Classic (the original unforked blockchain) and Ethereum (the new fork), each with its own cryptocurrency. Ethereum has since undergone two more hard forks in the 4th quarter of 2016 to deal with more attacks. It subsequently increased its protection and security and eliminated several vulnerabilities. As of today, Ether accounts for 13% of the total market value of digital currencies traded. As the second most popular cryptocurrency available, and an influential decentralized community behind its rise, it bears watching as a trendsetter of the cryptocurrency ecosystem and will play a large role in its acceptance worldwide. In addition to Ether, blockchains in general and to a larger extent, Ethereum larger capabilities to transfer value between participants via means other than Ether and Bitcoin. Smart contracts help participants exchange money, property, shares or anything of value by translating contracts into code and executing that code in line with the terms of the agreement, supervised by the network that runs the blockchain. By this means, contracts can be effortlessly delivered and executed with all terms built into the code and with equal visibility provided to all participants. That way, any changes made to such agreements need to be validated by all participants. Smart contracts define and enforce the rules, conditions and positions built into the agreement. For example, if a tenant seeks to rent a house from the owner, the tenant can do this via blockchain py paying in cryptocurrency. A receipt is given to him/her, which is held in the virtual contract. The owner then gives the digital entry key to the tenant by the specified date, basis which the money is then released to the owner. This entire transaction is witnessed by hundreds of people, due to which the delivery is faultless. Bitcoin and Ethereum today can support only a fraction of transactions per second that is supported by VISA, Paypal, etc. This limits their use as method of transaction for purchase of goods and services. While there are ongoing projects that are looking to scale up the number of supported transactions, e.g. Raiden for Ethereum, it will remain to be seen how liquid these enhancements make and over what time frame. Can Bitcoin Blockchain security be compromised? The strength of Bitcoin and other cryptocurrencies is its distributed ledger. It means there is no one central authority controlling the network. Transactions, etc. are validated through consensus. But in theory, what could go wrong? If a group of miners form a cartel and controls more than 50% of the computational power on the network, it can always mine blocks faster than whoever has the other 49 percent. In that case, it effectively controls the ledger. If such a cartel is malicious, it can spend Bitcoin twice, by deleting transactions so they are never incorporated into the blockchain. The other 49% of miners are none the wiser because they have no oversight of the mining process. Quantum computers are a different type of computer than any of our current machines. It uses quantum superposition to speed up many of the processes that would take years in conventional computers e.g. factoring large prime numbers. Prime number factoring difficulty is an underlying assumption for most public key encryption systems today and even Bitcoin in a way. Bitcoin has a cryptographic security feature to ensure that only the owner of a Bitcoin can spend it. The idea is that the owner generates two numbers—a private key that is secret and a public key that is published. The public key can be easily generated from the private key, but not vice versa. A signature can be used to verify that the owner holds the private key, without revealing the private key, using a technique known as an elliptic curve signature scheme. In this way, the receiver can verify that the owner possesses the private key and therefore has the right to spend the Bitcoin. The only way to cheat this system is to calculate the private key using the public key, which is extremely hard with conventional computers. But with a quantum computer, it is easy. And that’s how quantum computers pose a significant risk to Bitcoin. As per recent research papers, the elliptic curve signature scheme used by Bitcoin is much more at risk, and could be completely broken by a quantum computer as early as 2027. Indeed, quantum computers pose a similar risk to all encryption schemes that use a similar technology, which includes many common forms of encryption. There are public-key schemes that are resistant to attack by quantum computers. So it is conceivable that the Bitcoin protocols could be revised to make the system safer. But there are no plans to do that now. So far, regulatory and government authorities have struggled to keep up with the pace of development in this space. The Winklevoss Bitcoin Trust was an initiative to launch a publicly-traded ETF, filed in 2013 and rejected by the Securities and Exchange Commission in March 2017. The SEC rejected it on several grounds, from claiming that digital currencies needing to mature more as a tradeable asset to the lack of safeguards in the markets to prevent fraud and manipulation. The Winklevoss Bitcoin Trust would have offered investors the chance to acquire and trade shares based on a basket made up entirely of bitcoin holdings. European governments are worried about a different aspect entirely. There is a growing worry that money-launderers, drug traffickers and terrorists are using the world’s most popular digital currency. And governments within and without the European Union are driving this push, with France, Italy and even the UK seeking to regulate it. Two Nobel laureates, Joseph Stiglitz and Robert J. Shiller have denounced it in the last month alone, claiming it should be outlawed, doesn’t serve any social purpose and that “digital currencies were being driven by a narrative akin to a mystery movie that draws in people who wish to outsmart the system”. Garrick Hileman, a research fellow at the University of Cambridge's Judge Business School, has this to say, "What's happening right now has nothing to do with Bitcoin's functionality as a currency - this is pure mania that's taken hold." # Coinbase launched the first regulated bitcoin exchange in the U.S.
# The European Court of Justice has ruled that exchanging bitcoin should be exempt from Value-Added Tax, similar to how any traditional currency is treated. # As detailed elsewhere here, several businesses have started accepting bitcoin as a means of payment as well from Microsoft to Expedia and businesses running on the dark web such as Silk Road 2.0. As a fast moving space, and with the amount of capital flowing into Bitcoin, Indian and international governments and regulatory agencies have been cognizant of the potential and threat this poses to traditional monetary flows and the banking system as it exists today. This is above and beyond the potential rise of blockchain as a disruptor of the BFSI industry as we know it today. A recent survey conducted by the Income Tax Department on major crypto exchanges in India seems to be leading to notices being issued to about 500,000 high net worth individuals trading on Bitcoin in India. This is happening at a time when there is still no regulatory clarity and oversight on cryptocurrencies and Bitcoin exchanges in India. In the three notifications that the RBI has issued so far on Bitcoin, it has chosen to take a cautionary stance advising the public on the risks of these currencies and the lack of authorization and licensing in this space so far in India. After repeated circulars from the RBI, the government finally set up an inter-disciplinary committee to examine the existing framework of existing currencies. As of the time of publishing, Arun Jaitley, Finance Minister reiterated the government’s current stance on cryptocurrencies in the 2018 Winter Parliament i.e. that they cannot be considered as legal tender and the government will make its decision once the committee submits its findings. There is currently ongoing a debate on how cryptocurrencies are to be treated, whether as a currency (given its widespread adoption as an instrument of transaction) or as a trading asset (to be regulated by applicable frameworks, from investor risk to value creation and potential for anti-trust). The nature of blockchain makes it a unique entity, one which will struggle to fit into the policy prevalent today. In the midst of all this, several platforms have come up in India and other markets offering retail investors quick and easy means to invest in Bitcoin. With the lack of regulation on investing and taxation into digital currencies, these platforms are dependent on the constantly changing legal and taxation guidelines concerning Bitcoin. Zebpay, one of India’s leading platforms for investing in cryptocurrencies, hit USD 2 million in revenue in FY 2017 and claims to process trading volumes worth INR 70 cr+ everyday; adding over 2 lakh new users every month. Another means to create value in the cryptocurrency space is to participate in an ICO. Initial Coin Offerings are a means to raise funds for new cryptocurrency ventures or start-ups. Where in an IPO, stakes in the venture are sold to investors in exchange for legal tender, in an ICO, digital tokens, or coins are sold to backers in exchange for legal tender, or other cryptocurrencies (usually Ethereum or Bitcoin). However, in an ICO, this exchange is largely publicly driven, similar to a crowdfunding campaign (but with actual exchange of stakes/equity of sorts and not a donation). The Securities and Exchange Commission (USA) announced its intention to treat coins as securities which are subject to agency regulation. In December 2017, it shut down an ICO initiative by the name of Munchee, which was seeking to raise USD 15 million in capital to enter the restaurant review space. It raised about 200 ether before closing as per the SEC’s update. However, the technicality cited was that Munchee should have registered with the SEC before raising capital, which it did not. This lack of clarity is a valid concern for the general public looking to participate or invest in this space. Beyond the risk, ICOs offer a means for greater participation in the blockchain surge. Ventures seeking to raise capital via cryptocurrencies are listed on the internet and a simple search will help identify opportunities for investors. However, caution is advised in entering this space. Benchmark indices end flat but on a negative note on Tuesday as gains in IT stocks were offset by losses in oil refiners such as Hindustan Petroleum Corp, with sentiment dampened after data showed the countrys trade deficit widened in December. Indias December trade deficit widened to its highest in more than three years as higher import bills for gold and crude oil weighed on rising exports, government data showed on Monday. The trade deficit widened to $14.88 billion last month from $13.83 billion in November, data from the Ministry of Commerce and Industry showed. Oil refiners fell as global oil prices rose to near three-year highs due to production curbs in OPEC nations and Russia and robust demand from healthy global economic growth. Nifty spot close above 10705 will result in some upmove in coming trading session and if it closes below above mentioned level then some sluggish move can be seen. Avoid open positions for tomorrow. CRUDEOIL is trading at 4111. If it breaks and trade below 4100 level then expect some profit booking in it and if it manages to trade and sustain above 4125 level then some upmove can be seen in it. Nifty is trading volatile. Nifty spot if manages to trade and sustain above 10730 level then expect some upmove in the market and if it breaks and trade below 10690 level then some softness can be seen. Nifty is looking dull and weak. Nifty spot if breaks and trade below 10710-10700 levels then further decline is expected in the market and if it manages to trade and sustain above 10730 level then some upmove can follow in the market. ZINC is trading at 218.20. If it breaks and trade below 218 level then further decline is expected in it and if it manages to trade and sustain above 218.60 level then some upmove can follow in it. Sell on every rise till it holds below 218.60-219 is recommended in it. FEDERALBNK Future is trading at 106.20. It will find immediate support at 106. If it holds above 106-105.80 then it is likely to show some quick upmove however if it sustain above 108 level then pull back till 112 is expected within few sessions. The Bombay Stock Exchange (BSE) has approved a share buyback of Rs 166 crore. This buyback comes within the first year of the exchanges listing. In an interview with CNBC-TV18, Ashish Chauhan, Chief Executive Officer of the BSE shared more details. We have a lot of cash on our balance sheet and we will continue to use that cash in an optimal manner, he said. We are very keen to start a commodity exchange on our own, he added. We have announced that on January 29, we are going to launch mock trading of commodity exchange, said Chauhan. He hopes to make a real launch of commodity exchange by October 2018, he further mentioned. Reliance conference has started with the motto of JIO expansion. Wild swings expected in the market. Nifty spot if manages to trade and sustain above 10750-107650 levels then expect some upmove and if it breaks and trade below 10730 level then some softness can be seen in the Nifty. After positive opening nifty is now trading in negative zone. Nifty spot if breaks and trade below 10700 level then further decline is expected in the market and if it manages to trade and sustain above 10742 level then some upmove can follow in the market. Nifty to turn volatile as the day progresses. Global cues to play important role. Nifty spot if manages to trade and sustain above 10760 level then expect some further upmove in the market and if it breaks and trade below 10720 level then nifty can decline however 10600 will act as crucial support for intraday. Please note this is just opening view and should not be considered as the view for whole day. Please visit this section again during trading hours for Live Stock market view, Commodity view, Share tips and Commodity tips for good gains.